On Feb. 25th, 2019, IOST Mainnet Olympus v1.0, was officially launched. IOST has partnered with multiple mainstream mobile wallets in the crypto world to provide our users convenient and secure digital asset management services as well as content-friendly and powerful DApp experiences. IOST introduces our first series of wallet partners in this article, and these wallets will be released on IOST early next week. TokenPocket is a multi-currency, multi-bottom decentralized universal digital wallet, which integrates digital asset management, trading, financial services, resource leasing, node voting, market information, authority management, account management, DApp distribution, instant messaging and other functions. TokenPocket is committed to becoming the entry to the digital world of blockchain, simplifying the complexity of using blockchain, and serving tens of millions of developers and users. TokenPocket has the most active Dapp users on EOS. It provides instant messaging based on multiple public chain account verification system. Token rewards and giveaways are decentralized and will be integrated with the IOST ecosystem. TokenPocket will be ready on Olympus v1.0 early next week, and provide IOST with support across technology development, DApp incubation, market promotion, etc. In addition, there will be surprise activities waiting for the participation of community members. Stay tuned for the official announcement of IOST! Cobo is committed to building a one-stop digital asset storage and management platform, providing users with a secure and reliable storage and payment environment. Cobo is founded in November 2017, headquartered in Beijing, with offices in Seattle, Shanghai, Xi’an and other major cities. The company’s founding team has significant influence in the blockchain industry. Team members hailed from F2Pool, Google, Facebook, Twitter, Alibaba, 360 and other Internet giants, with extensive industry experience. As a company, Cobo emphasizes long-term security, reliability, and convenience. Altogether, Cobo offers a secure mobile wallet (Cobo Wallet), high-end cold storage wallet for advanced users (Cobo Vault), and custodial services for institutional investors (Cobo Custody). Cobo will set up a special fund for IOST community ecological management and project incubation in Cobo Ecology. Early next week, Cobo’s main wallet will also be officially integrated to IOST Mainnet. At the same time, we will prioritize the integration of IOST DApp in Cobo HD wallet. 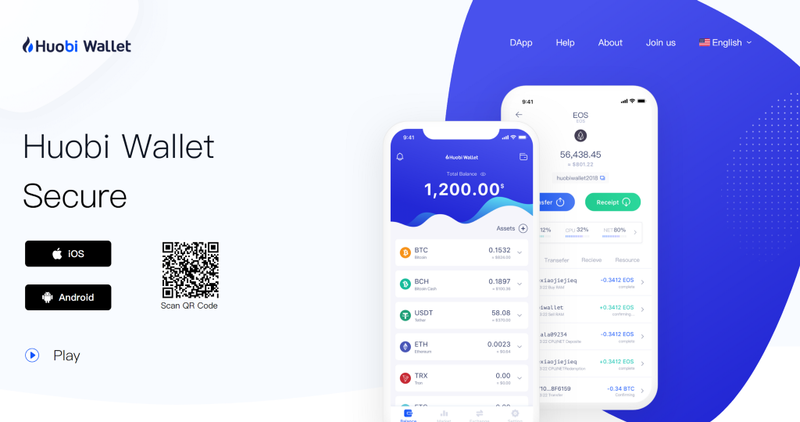 Huobi wallet is a professional multi-currency wallet, relying on the accumulated technology and safety experience in blockchain, it guarantees the asset security of global digital currency users from multiple dimensions, and provides simple, convenient, safe and reliable digital asset management services. By early next week, Huobi Wallet will officially join Olympus (IOST Mainnet), and will provide digital asset management services and other DApp experiences to support the IOST network. Secrypto is a safe and easy-to-use wallet that can be easily and intuitively operated by both beginners and advanced crypto users. It is the first encrypted wallet in the market that integrates multiple wallets and utilizes the highest level of security and the breakthrough “read-only” mode, allowing you to safely manage all encrypted currencies. Early next week, Secrypto will join IOST Mainnet and provide fun exciting DApp experiences! Trust Wallet, currently the leading mobile ETH wallet, was acquired by Binance in 2018. Trust Wallet can be used in conjunction with any ERC20, ERC223 and ERC721 tokens. It is safe, reliable and easy to operate. Monarch is a Fiat-Crypto exchange with a Decentralized Universal Crypto Wallet, a unique payment solution allowing businesses & individuals to accept crypto but get paid USD/Fiat quickly, while allowing recurring payments for monthly bills as well as a security token launch platform, crypto borrowing & lending. As a team that creates lightweight unmanaged wallets, Magnum Wallet’s mission is to help users increase wealth and protect their property security. Users have complete control over their private keys, which are stored in encrypted backup files and are safe and reliable. After the launch of Olympus, Magnum Wallet will start supporting IOST, and will provide users with additional functions such as built-in exchanges, bookkeeping support, voting, DApps marketplace, transaction tracking and so on in the future. More Wallet Partnerships Coming Soon! In addition to the first batch of mobile wallets displayed, IOST is also co-developing with other leading mobile wallets. In desktop and offline scenarios, IOST is collaborating with well-known browser wallets, as well as browser plug-in wallets and hardware wallets with the participation of multiple community developers to add more wallet choices for our users. Various types of wallets will be gradually released to IOST users in March! IOST x Wallet Partnerships Series | IOST Ecosystem Navigation was originally published in IOST on Medium, where people are continuing the conversation by highlighting and responding to this story.